Order Your Awnings Now and Pay Later with our Special Financing Options and Get a Head Start on the Summer Heat! Just Select PayPal in the Shopping Cart and Sign Up with Bill Me Later. Bill Me Later purchases of $99 or more. We’ll send you reminders to let you know when your statement is available online and when payments are due. Take advantage of promotional financing on multiple purchases up to your available credit line. We’ll help you keep track of when each promotional balance is due. If you’d like to take more time to pay, interest will accumulate at an Annual Percentage Rate (APR) of 19.99% starting from the date of this purchase. If the balance is not paid in full, the accumulated or “deferred” interest will be added to your account balance when the promotional period for this purchase expires. If you need to sell your home, you know that you have some tough competition no matter where you live and size or style of your home. There are probably many new houses, townhouses, condominiums, and other types of homes within your immediate area that are all also up for sale. This means you need every advantage you can get, and even something as small as porch awnings can help in this regard. How do porch awnings help to sell a home? Does this mean all types and styles, and when you’re ready to make a purchase of one, is there anything you should keep in mind if your house will be up for sale? Often metal porch awnings need to be updated, cleaned, and even painted if someone wants to sell their home, if these are not in good shape. But for homes that do not have these coverings, it’s important to think about the type you purchase and why they’re so important. Here are some quick considerations for anyone with their home on the market as to why porch awnings can help to sell that home. When you are selling a home, the more space it has, the more likely it is to sell. Outside spaces count as well! Porches, decks, and these areas can seem like extended living spaces, if they’re presented properly. Without porch awnings, those spaces can get hot and uncomfortable and be very unwelcoming. However, if they have a nice covering you can set up a table and other furniture no matter the time of year you sell your home. By covering them with porch awnings you make prospective homebuyers imagine themselves sitting out with coffee or a book or just enjoying themselves while the children play in the backyard. Good porch awnings provide shade and comfort, and this means a person or family can sit out all hours of the day. Many are concerned with the safety of sun exposure and so may not appreciate a deck or area that is not covered by porch awnings of one sort or another. This makes them vital to the sale of your home. It is important to remember that when you are selling your home, you want to keep things neutral so that you appeal to the widest range of homebuyers. This includes when you shop for porch awnings. You may like the look of wide, bold stripes, but for putting a home on the real estate market, think of more neutral shades and designs. There are many porch awnings that are neutral yet attractive, and so these may be a better choice for you. It may also be worth it to consider automated porch awnings as these are preferred by homebuyers; they’re easier to use and can be opened at a moment’s notice for those sudden downpours! Keep these thoughts in mind if you have a home on the market and want to showcase your outside space. There are many ways that we can improve the look of the interior of our properties, but a great way to make the outside look better is with home awnings. There are many ways to achieve this as you can adorn the front door, garage doors or even the back yard with some lovely home awnings. Not only do you get a great look, but home awnings are incredibly useful and cost effective too. Good awnings attached over the front door will make your home seem very welcoming to your visitors. They also make a statement about you as well as you can choose many different styles and colors. Some may prefer to go for an understated lighter shade of fabric to give a cooler feel, whereas bright, vibrant colors will be warm and inviting. Home awnings will also protect your windows, front door, patio doors or garage doors from the severity of the weather, be it heavy winds and rain or strong sunshine. It maybe though that you want home awnings installed to protect you and your family from the weather. Patio or deck awnings are a fantastic asset to have and make it seem like you have an additional room at the back of the house. This affect is created without the great expense and aggravation of building an extension or conservatory onto your property. Home awnings provide you with a sense of a great well being as you can spend more time outside. Doesn’t it just feel great to be able to sit on the patio whilst enjoying breakfast, lunch or dinner or even just a quiet drink after a hard day at work? You can do this knowing that your home awnings will protect you from the risk of showers or shade you from the intense heat of a summer’s day. When looking at home awnings you can choose widths and projections of many sizes as well as many different colored fabrics. It is also possible to have a motorized model that you can operate with just the click of a switch. These have the added feature of reverting to being hand operated in case of power failure. Alternatively the standard hand operated home awnings are equally easy to use with a crank lever. PYC Awnings offer a wide range of products of excellent value and quality. These include door, window and patio/deck awnings as well as roller curtains and patio umbrellas. The frames are made from steel pipe that is much heavier than any steel tubing making them more durable in strong winds. A money back guarantee is provided on all custom made products. When it comes to giving your home, store or restaurant a fantastic welcoming look, you cannot beat quality fabric awnings. Fabric awnings come in a wide range of colors, styles and sizes and not only look good but also provide fantastic practical use as well. So what makes fabric awnings more appealing than say the long lasting metals ones? From a practical standpoint there is no doubt that an aluminum awning will serve you well, but let’s be honest they are not quite so pleasing on the eye. A good quality fabric will after all still last a good ten years, if not more and gives your home or business a great look. Not only that they can very easily be replaced. The concept of using awnings has been around for a very long time when people used wooden mats to protect their market stalls and homes from the sun. Linen fabrics were then later used to decorate theaters with the help of poles and beams. The concept has evolved over the years so that now we have the choice of different fabric awnings and a far wider range of colors. A good quality awning will help protect your property, patio or deck from the elements. More importantly with fabric awnings you can enjoy the outdoor life whatever the weather. It is so nice to come home from a long day at work and enjoy a cold glass of beer on the patio, knowing that even it does start raining you can stay outside. That said it is important that your fabric awnings are purchased and installed with a good quality material that is waterproof, and where the color will not run or fade in the sun. Another advantage of using fabric over other materials such as aluminum, fiberglass or polyesters is that it is much cheaper. They are also much easier and quicker to install than other materials. Another helpful thing that fabric awnings offer is that the material can easily be removed if it is necessary. For example if you are anticipating extremely strong winds or even hurricanes, it is easy to detach the material to avoid damage. Of course this is also helpful if you are looking to change the style of your fabric awnings. Changing the style of your fabric is much easier and cheaper than replacing the whole awning. So if you move into a new home and find the existing fabric distasteful or just fancy a change of color it is easy to do. PYC Awnings can help in this regard with a great selection of replacement fabrics for awnings. 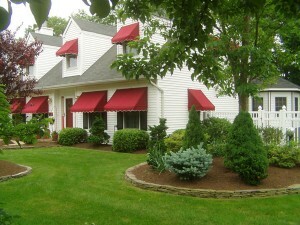 The fabric awnings have a 10-year guarantee and any cover can be custom made. So if you are looking to improve the look of your front door or windows or perhaps need a suitable cover for the patio, then fabric awnings are the answer. They provide a much cheaper and easier way to protect your property from the elements. Door awnings are a fantastic way to make your house seem incredibly welcoming for your guests. However, door awnings are not just decorative features as they serve a very practical purpose too. After all, the front of your home or business can be very exposed to the weather and therefore door awnings provide great protection from the sun and the rain. The most popular types of awnings are generally canvas or metal. However, there is no doubt that canvas door awnings are far more aesthetically pleasing than the metal equivalents and as such more popular with home owners. You can also find a great range of colors with canvas awnings that will suit the style of the property or the taste of the home owner. Shop owners are also keen to have door awnings as a welcoming feature for customers. It shows a caring attitude to browsing customers and will make them feel more inclined to browse inside. Of course for home owners a nice garden at the front of the house offers the same effect, but door awnings give that extra welcoming touch. The aesthetics are important but there are very practical uses here too. Door awnings are proven to absorb heat from the sun, meaning that property owners do not have to rely so much on air conditioning to keep the house cool. As an addendum, awnings provide great protection from the wind, rain and other unwanted particles the environment chooses to throw at us. Fitting awnings to the doors of your home or business is a really good idea. In tough climates doors can be prone to damage making them unsightly and can cause some harm. Awnings will save the cost of repairing or replacing your doors on a regular basis as well as the cost of air conditioning. It is also a much more cost effective way of protecting the front door than building a porch for example. Door awnings do not just have to be applied to the front of the house as they can be fitted to patio doors, garage doors or even doors on mobile homes. These are a relatively cheap way to protect your doors and provide a good look to the home. In fact, door awnings will add value to your home so long as they are well looked after and of good quality. PYC Awnings offer fantastic made to last door awnings that customers can purchase in a wide array of colors. These awnings are constructed with ¾” OD galvanized frames that are designed to withstand gusts of up to 50 miles per hour. Aside from the excellent quality of the awnings, they are very simple and quick to install and are available in widths of up to 240″ and a projection of 40″. Take a browse around the PYC Awnings website to see all the colors and sizes of door awnings that are available. You will find that fitting a door awning is a great addition to the home. Canvas awnings come in so many colors, prints and patterns. A good high quality awning will come with a good warranty. If the company makes a good product, they will not be afraid to offer a 10 year warranty on their canvas products. Awnings are available to fit any kind of door as well as windows. Single doors, French doors and sliding doors can all benefit from awnings. Canvas awnings also reduce the ultra violet rays that enter the home or building. Ultra violet rays are the number one cause of skin cancer. Reducing the amount of UV ray exposure in your home or business is an important health concern. Enjoy having your windows open to light without running up the power bill or exposing yourself to the sun’s dangerous rays. Canvas awnings can also be used to create an extra outdoor room. Sun rooms and metal covered patios or decks are much more expensive than an awning. If you enjoy the outdoors but do not want to sit in the direct sun, awnings are a great way to put more shade in your back yard. It is great for grilling, watching the kids or grandchildren play in the yard and many other activities. Canvas awnings are also a great way to continue to sit outdoors during a brief summer shower. Instead of hopping up and dragging everything inside when it rains, stay outside and enjoy the fresh air with a nice summer rain fall. An awning is a great way to make this possible. It can also let you continue with your grilling or other activities without being interrupted by a brief shower. Canvas awnings are durable and last a long time. When they do wear out, years down the road, you can have the canvas replaced without having to take down the entire awning. In many cases the canvas can be sealed or repaired to make it last even longer. They are a good investment in the looks, practicality and functionality of the home. Canvas awnings can be used to decorate in addition to saving energy and blocking the harmful UV rays of the sun. Awnings can add a look of nostalgia to the architecture of the home. Many styles of home look rather straight and boxy. The addition of awnings brings all new visual features to the design of the home. It makes the house look like a home. Canvas awnings are a fraction of the cost of other covers for patios, decks and other outdoor areas. They also make an affordable, convenient eating area in the outdoors. They will cut your cooling bills and help you to stay healthy. They also add value in the appearance and functions of your home. Awnings have a lot of benefits that you may not even be aware of. Covering the windows in this way can reduce your energy costs from 60% to 70% and even more on west facing windows. They are useful for both homes and businesses. They can also be an attractive addition to the architecture of the home or building. Some of the styles are old fashioned and give a nostalgic look to the structure. Awnings are environmentally friendly because they reduce the energy consumption in the building. They will also reduce the amount of ultra violet rays that enter the home or business. Over 90% of all skin cancers can be prevented by reducing our exposure to the light of the sun. covering open windows can reduce your exposure to these harmful rays and greatly reduce your chances of getting skin cancer.Awnings also can be used to extend the living space of your home. They are far less expensive than adding a sun room to the house or having a metal cover put over the deck or patio area. This is an inexpensive way to add to the shaded areas you can enjoy outdoors. Enjoying your backyard will be more pleasant during hot weather, and will be made possible during a light rain. Awnings made with Sunbrella fabric protect you from the sun or a light rain shower, further decreasing your family’s exposure to harmful ultra violet rays. They are available in over 100 designs, so you have a lot of options when it comes to the look of your outdoor areas. They are also available in tons of sizes, so you can have one for the smallest window as well as one to cover your entire patio or deck.Awnings over entrance ways is a great way to keep out the rain, sleet and snow. Opening the door lock and coming inside will be a lot easier with a little cover when it is nasty outside. It will also help you keep the mat by the entrance way clean so that feet can be thoroughly wiped off before people come in the house. This helps you keep your carpets clean or keep the hardwood floors protected from harmful wet spots and moisture.Awnings are an attractive outdoor decoration in addition to being environmentally friendly and huge energy savers. A dull exterior on your home can be livened and brightened by the addition of Awnings over the windows and your front door ways. There are colors available to match, compliment or contrast with any color paint, brick or siding. The styles are appropriate for almost any type of architecture that your home has. Awnings are found readily that are cheap, but these will not last very long. A quality made piece with sturdy poles and fabric will last for a long time. When the time comes for it to be replaced, that can be done with the highest quality of fabric as well.Awnings are available online. They are easy to install for do it yourself home owners. In just a few hours you can change the entire look of your home or business. Or, you can add an entirely new living area to your back yard in even less time. Check out these home improvement tips here at Bob Vila’s website on how to save money on cooling cost during the hot summer months. Thanks Bob Vila and Hugh Howard for using a photo of our PYC Awnings for one of your tips on home improvement and saving energy cost! See our 3 Different Styles of Window Awnings that can help you save on energy cost. The Professional Awning Manufacturers Association (PAMA) has done a new study in 50 states and has concluded that Awnings can save up to 50% in cooling cost. Awnings provide shade and with the rising cost of electric the savings can be substantial. Adding awnings to your home not only adds curb appeal, but they will pay for themselves and save you money on cooling cost for years to come. The study focused on older homes that are typically smaller and less insulated than newer construction. Resulting data supports awnings and solar shades as “smart” retrofits to help make older homes more energy efficient. The study in its entirety is now available.